Working within the SEO field you will always have to look out for Social Media topics since they still might (or might not) have impact on your day-to-day work. In the last few years the workload has been raised quite a bit and a lot of SEOs now also have to deal with Facebook pages and Twitter accounts for various pages in their day-to-day workflow. On top of that now the Google+ Pages have arrived which will take even more of that time away which is usuually already in short supply! The daily “Oh, crap, I still gotta update that Plus-Page today with some interesting and up-to-date stuff for my visitors” limbo will leave you scrambling at times to find suitable content which is also interesting enough to make sure that visitors keep on coming back. Also of concern is a certain “neutrality” of the content, something like “general news” mixed with your own generated marketing content, right? Now where can such general news be found? Obviously Google themselves are a great and vast resource. However, skimming through search results on daily basis will just tie-up that extra time you might need for other stuff. So how about if Google just helps you out a bit and delivers daily fresh content which can be added with a simple drag&drop? 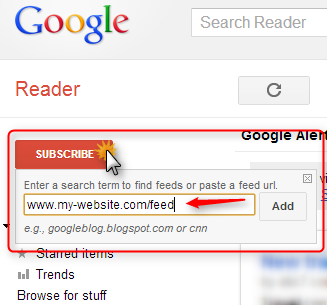 This can be achieved quite easily by combining two great Google resources: Google Alerts and Google Reader. The following guide will show you how you can set up a simple processes which then enables you to easily update your Google+ Pages within 30 seconds every day – it really is just that easy! Google Alerts is a great resource for link building (see a German guide from Eisy about this), but also in general to receive interesting news which are related to certain search terms. For example, if you would like to receive interesting news for your travel website you could enter the keyword “travel” and get all the newest results found by Google. So what if you are looking for the latest travel industry news? Or authority news for a keyword which is also one of the most important ones for your own webpage? Such news are also great if you can use them for your Plus-Page: for example, a link to an article of a respected newspaper might give your page that extra bit of more authority. When setting up the Google Alerts with the keyword (Pos 1.) and the recommended settings (Pos 2.) you then will receive authority news on a regular basis for that keyword that you have entered. Create the alert and on the next page you will then find an overview of all your created alerts. In order to further use the news stream for your Google+ Profile you then need to go ahead and transfer the newsfeed over to your Google Reader: click on the “Google Reader” link and you will be redirected automatically over to the corresponding section of Google. What about your own news? So what do you do with your own news? Great content that you wrote up yourself, has been posted at your website and also needs to be added to your plus page? 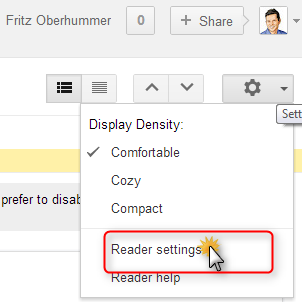 This also has the added benefit that you can manage all of your pages news in one ressource for transfering them over to Google Plus: just add your other news feeds to the Google Reader Tab. 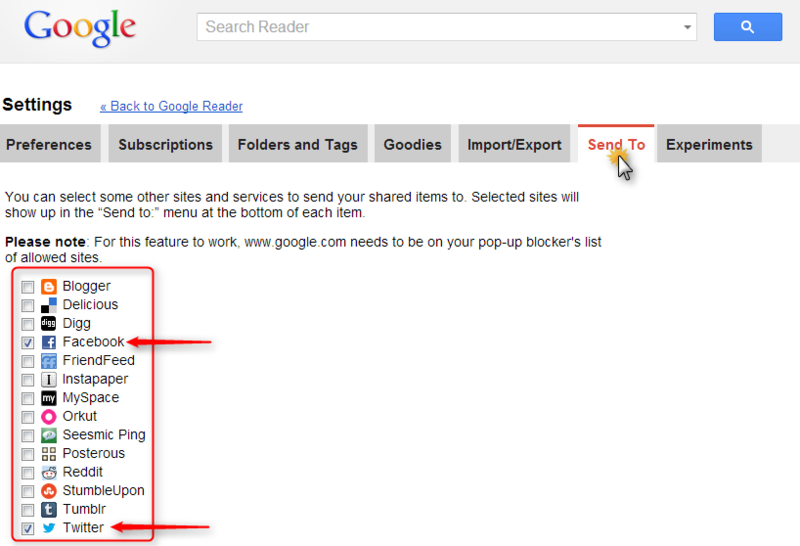 Google Reader also features a nicely hidden option where you can enable direct sharing for Twitter, Facebook and other networks. Do some research via Keywords/Hashtags in Google+ to find people with topical relevance; circle them, comment at their posts and let them in return discover your great up-to-date Google+ Page! Use Google+ Page in link building and post it at authority sites, blogs, forums, newspapers etc – let people out there know that you have some great content going on at your Plus Page. Google+ is here to stay and I think it will be a great channel to deliver public-relations-style content to interested users (eventually it might even wipe out Twitter, who knows). This entry was posted in Google, Google+, SEO, Social Media and tagged autopost Google+, Autoposting Google+, Content, google, Google Alerts, Google Plus Profile, Google Reader, Google+ Page, How to get content on your Plus Page, Plus Page, SEO. Bookmark the permalink. Post a comment or leave a trackback: Trackback URL.